It was with a sense of caution that I approached the next Diablo Cody project. I enjoyed "Juno" (who didn't?) as it gave the young, cynical, and more times than not dismissed generation a satisfyingly sarcastic voice. It tackled a subject that had become taboo and did so in a fresh light with real characters and situations, but most importantly, great dialogue. She simply tried to hard with her second effort, "Jennifer's Body" and it came out more camp than cool. When the trailers first appeared for "Young Adult" though it seemed like the good ole' mentality of snappy, black-comedy Cody was in full effect. It was also nice to see Charlize Theron getting back into the scene with nothing but a supporting role in 2008's "Hancock" filling her resume as of late. The combination of Cody's character and Theron's craft is an experiment in the human psyche. Theron's Mavis Gary is a mess, and we all realize it from the very beginning. Everyone around her knows it except for her. Mavis lives in a reality where she is to be envied and Cody does a wonderful job of making the character slowly be revealed not to the audience but to herself. It is an inverse experience, like watching a train wreck you already know will derail. Director Jason Reitman continues his winning streak with "Young Adult" even if it doesn't hit that gold standard his three previous films did. (Charlize Theron) seems a little jealous. As Mavis, Theron channels her inner child, or more accurately her snobby teenager, as one of the few from her high school class that made it out of the small town of Mercury. She made it to Minneapolis and became a ghost writer for a popular teen lit series. Cody uses the job as a way of guiding us through Mavis's worldview. It is a smart technique because despite the story taking her back to the high school surroundings we are indeed given the adult Mavis. Her writing gives a glimpse of how she came to be the way she is by the point of view she gives her main character. On the day we become acquainted with her she discovers an email from her high school beau that plasters a picture of his new born baby loud and proud on her display. This makes something in Mavis snap, as if the email is a deliberate insult to her. This is the first hint there are more deep-seeded issues at work here, but Cody is careful to not say too much too early and gives Mavis enough credibility as a character for us to trust the logic she is spouting. In a moment of what you could call realization but what is probably more impulse Mavis packs up and heads for Mercury. What she actually plans to do there is something we hope she realizes is complete ludicrous upon arriving. She doesn't. Thus setting up a string of cringe-worthy moments in which she attempts to re-ignite the flame with happily married, new daddy Buddy Slade (Patrick Wilson). Watching as Mavis desperately attempts to reclaim her glory days we see a woman to which you could apply the age old lesson of money and success don't buy you happiness, which is certainly a lesson here, but it isn't given to us in a preaching manor. It is so underlying in fact it doesn't even feel like the moral of the story. "Young Adult" is instead an exercise in exploring those meanings in life that come with the goals you achieve and what they mean if you stop trying and cling to the idea of who you once were. Mavis believes she is better than everyone in her home town because she moved away and has a job that made her semi-famous. The success of her book series has long since faded and as a newly divorced 37-year old she leads a life of dates with no spark that she still sleeps with in attempts of filling a void. she wants to hear it or not. What she needs is a good slap in the face and because her return home only gives her reason to feel better about her situation we are given the character of Matt Freehauf. As played by the always cherished Patton Oswalt, Matt is the fat geek from high school who everyone thought was gay. There is a surprisingly violent backstory to his character that allows Oswalt an even bigger advantage when serving Mavis a look at who she really is and what she has become rather than her own ideals. Oswalt, for me, is the real star of the film. Despite Theron giving a committed and funny performance Oswalt knows Matt, he has probably been in a similar situation before and the look in his eyes when he delivers each line matches perfectly. I was aware the trailer hinted to predictably at where he and Mavis's relationship might lead, but was happy to see it turn out more truthfully than cinematically. 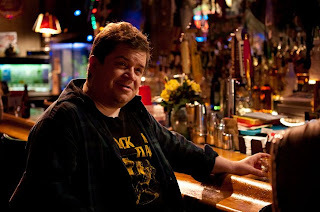 If you see the film and you know that guy Oswalt is playing, just relish in the facts that he brings to the screen. That in the end it doesn't matter who won best hair but who finds themselves in a place they are happy with twenty years later, long after their "prime" has passed. I walked away from "Young Adult" content with the experience I had, but was not left with the same impression as Reitman's other films . Even with their sly comedic tones "Thank You For Smoking" and "Up in the Air" were insightful pieces of filmmaking that really left you with a feeling of insight, of love, and most importantly an experience. The same could be said about "Juno" as he has successfully brought Cody's words to life before. He guides the story here with a clear sense of what he is doing and what he is going for. It is somewhat of a different animal for him to tackle, but his experience with "Thank You for Smoking" is most apparent here. He approaches it with the slow, focused shots that study our protagonist rather than the quick cut editing that made "smoking" such a riot. It works though and the story has enough bite that you will be entertainingly distracted from your problems for an hour and a half but don't expect the gravitas of the previous Reitman films or the extent of wit that "Juno" held. This is a good enough partner in both's filmography but likely the most forgettable in the long run.